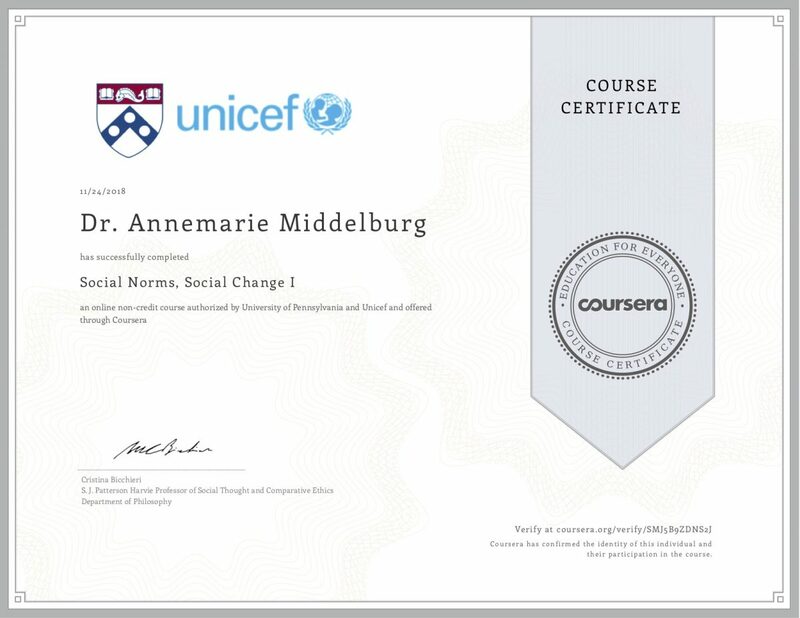 The 24th of November 2018, I successfully completed the course ‘Social Norms, Social Change’ of the University of Pennsylvania and UNICEF. I already came across the work of prof. Christina Bicchieri during my PhD research about Female Genital Mutilation/Cutting (FGM/C) in Senegal. I studied her work in relation to social norms (“the rules that glue societies together”) and refer to her theory in my own research. 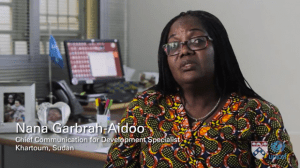 Over the past years, I have conducted many assignments in the field of social norm change as an individual consultant, both for the UN as well as for civil society organizations. I therefore decided to further deepen my knowledge on this topic. I believe that you never know enough. And indeed, after completing the course I can say that it’s always good to learn more! The course took 4 weeks and I really enjoyed it. To my mind, the format made the course very interesting. We had each week short (few minutes) lectures, as well as longer ones (15-20 minutes) of prof. Bicchieri. In addition, short quizzes during the lectures were provided, see example on the right. Each week, we also had to complete 2 or 3 quizzes with multiple choice questions, covering the reading material and the lectures of that week. In addition, stories from the field were shared from different country offices of UNICEF, both in Africa and Asia, which made the course very much to the point as well as dynamic. 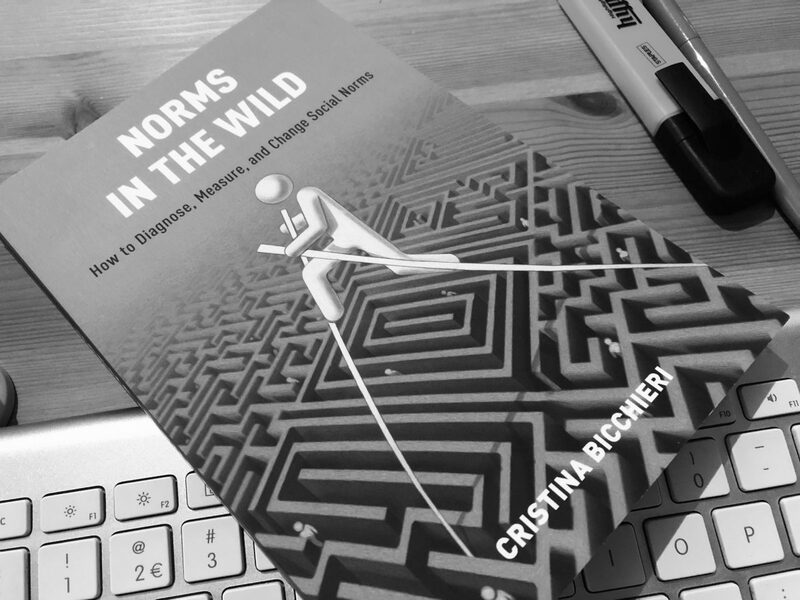 The reading materials came from the book ‘Norms in the Wild: How to Diagnose, Measure, and Change Social Norms‘ of prof. Bicchieri. Her work lies at the crossroads between philosophy, game theory and psychology. Her research examines the nature and evolution of social norms, how to measure norms (consensus and compliance) and what strategies to adopt to foster social change. She has combined evolutionary and game-theoretic tools with models of decision making drawn from cognitive and social psychology. For example, she uses her theory of context-dependent preferences to build more realistic evolutionary models of the emergence of pro-social norms of fairness and reciprocity. The course ‘Social Norms, Social Change’ teaches how to diagnose social norms, and how to distinguish them from other social constructs, like customs or conventions. These distinctions are crucial for effective policy interventions aimed to create new, beneficial norms or eliminate harmful ones. 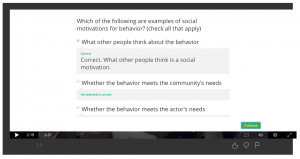 The course also teaches how to measure social norms and the expectations that support them, and how to decide whether they cause specific behaviors. What I particularly liked about the course is that it included many examples of norms that sustain behaviors like child marriage, gender violence and sanitation practices. In the lectures, prof. Bicchieri introduced all the basic concepts and definitions, such as social expectations and conditional preferences, that help us distinguish between different types of social practices like customs, descriptive norms and social norms. 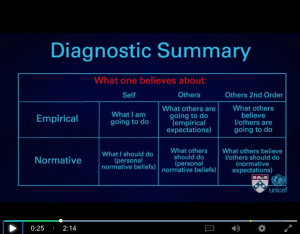 Expectations and preferences can be measured, and these lectures explain how to measure them. Measurement is crucial to understanding the nature of the practice you are facing, as well as whether an intervention was or was not successful, and why. More specifically, the course started in week 1 with the differences between collective behaviors that are completely independent (when they are purely determined by economic or natural reasons), and interdependent (when other people’s actions and opinions matter to one’s choice), and why this distinction is important. We also touched upon the ‘reference network’ and elaborated on what ‘social expectations’ are. In addition, we focused this week on empirical expectations, which are defined as expectations about what other people do and how other people act in certain situations. Prof. Bicchieri explained how empirical expectations matter to one’s choice. In week 2, we focused on normative expectations. Contrary to empirical expectations, normative expectations are expectations about what other people think we should do. They are often accompanied by sanctions (positive or negative). Normative expectations should also be distinguished from personal normative beliefs, because that is that we think we should do (for example moral or religious beliefs). Examples of normative expectations were given from the field, by local UNICEF staff. An example of a normative expectation is the expectations of mothers who believe that their mothers-in-law think they should avoid giving first milk to a newborn. This is the reason that some mothers in Sierra Leone do not breastfeed their newborns. Another example came from Pakistani villages, where families believe that other families in their community think that they should marry off a girl immediately after puberty. They have normative expectations about what other people think they should do (so-called second-order beliefs). In week 3, we learned that empirical and normative expectations do not necessarily motivate behaviour. In other words, there is not always a causal relationship between one another. We discussed the concept of ‘preference’ and how a ‘descriptive norm’ can influence behaviour. Preferences may be socially unconditional, which means that they are not influenced by what other people believe or do, but they can also be conditional. In that case, your choice depends on what you think other people do or endorse. Descriptive norms are conditional on empirical expectations, but social norms are dependent on empirical and normative expectations. It sounds perhaps quite difficult, but the examples given during the lectures explained the differences between these concepts very clearly. In week 4, we focused on the concept of ‘pluralistic ignorance’, which means that many people personally condemn a behaviour, but wrongly believe that other people endorse it. This means that the normative expectation is false. However, people go along with it, and the behaviour continues, because there is no transparant communication. A very clear example given during the lecture was the alcohol usage / drinking behaviour of students at universities. Even if a student doesn’t like to drink a lot of alcohol, they believe that other students like drink a lot, because they observe in bars that other students drink a lot of alcohol. As a consequence, they start drinking as much to fit in and to belong to the group. However, if those individual students who do not like to drink so much alcohol would have the courage to speak out, the norm might change. However, since there is no transparant communication, the norm of ‘too much drinking’ continues. This also shows that changing social norms is difficult, because they are motivated by preferences conditional on empirical (do people expect others to engage in a specific behaviour?) 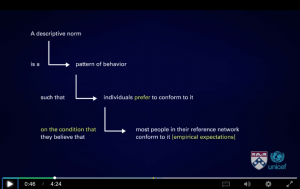 and normative expectations (do people expect others to believe that they should conform to that behaviour?). The last lecture of the course focused on how to measure social norms, which was very interesting. We discussed how we can diagnose a collective practice, what we need to measure (behaviour, personal normative beliefs, empirical expectations and normative expectations) and how to measure them. I passed all assignments and my overall grade for the course was a 9.0!